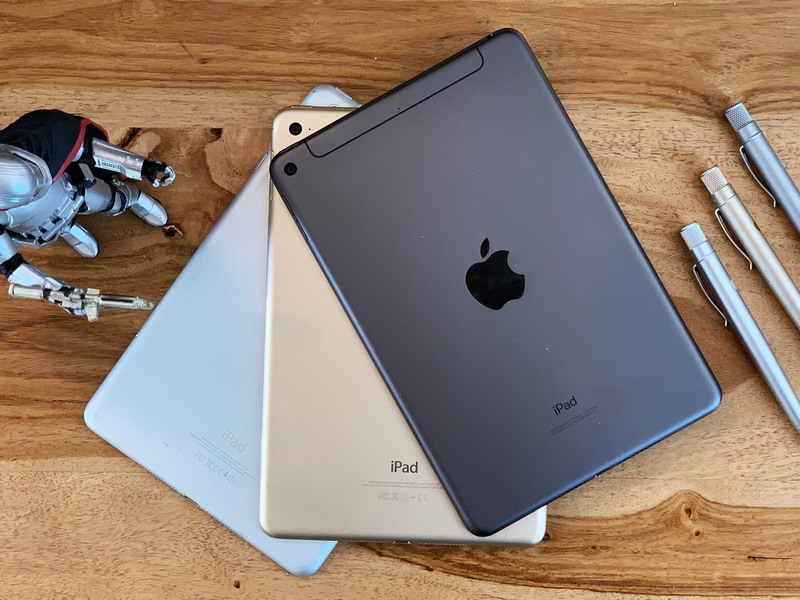 Back in 2010, you could get any iPad you wanted, provided you wanted the only 9.7-inch iPad Apple made… But, over the years, Apple has expanded the lineup to include the 7.9-inch iPad mini and the 12.9-inch iPad Pro. Just recently, they've even added a 10.5-inch iPad Air and 11-inch Pro. So, now, the iPad is spread across 5 different models and price points, and that's not even counting options like cellular or storage or even finish that makeup all the different SKU. (That's industry slang for stock keeping unit, but whatever.) My point is, you have a lot of options now and it can seem complicated, maybe even overwhelming if you're looking to upgrade or buy-in for the first time. But it's actually really simple to hone down on the one and only iPad that's perfect for you. I'm only skimming the details here. For far deeper dives, check out my specific reviews for all of these iPads. OK, so, picking your next iPad. Apple used to do grids but I prefer flows. You start at the beginning and you stop where it makes sense. If you just want an iPad you can take pretty much anywhere and do pretty much anything with, then you have the new normal, the new baseline, the new 10.5-inch iPad Air, starting at $499. If maximum portability is most important to you, and you're not only willing but eager to give up some screen size to get it, then there's the 7.9-inch brand new iPad mini, starting at $399. If you want more power and performance but still a good amount of portability, and premium is no problem, then there's the newly redesigned 11-inch iPad Pro, starting at $799. And if you demand not only power and performance but the biggest screen you can get, you can go all the way up to the newly redesigned 12.9-inch iPad Pro, starting at $999. That's still five stops on the flow, with room to fuss with the options in between them, so if you still need help making up your mind, let's dive a little deeper. If you need an iPad and that's all you really know or care about, if you're just starting out with tablets or looking to upgrade after a few or many years, if you just want to be able to do everything that an iPad can do, from reading to watching to communicating to working to playing, get the new iPad Air. It's got a 10.5-inch, wide gamut, Retina display, with TrueTone ambient color temperature matching, which is slightly bigger than the original iPad. It also comes with Apple's A12 Bionic chipset, the same one in iPhone XS, 3GB of memory, a Lightning connector, Touch ID biometric fingerprint sensor, two stereo speakers, a 7 megapixel, 1080p front-facing camera and an 8 megapixel, wide color f/2.4, also 1080p rear camera. You can get it in sliver, space gray, or Apple's current coppery gold, with 64 or 264GB of storage, and with just Wi-Fi or with Wi-Fi and cellular, so you can connect or share that connection from anywhere. It's also compatible with the 1st generation Apple Pencil, Logitech Crayon, and Apple Smart Keyboard for drawing and typing. They do increase the up-front cost but also the functionality. In other words, the iPad Air can do everything a modern iPad needs to do, starting at the same price as the original — $499. If you need a first or new iPad and price is the most important feature to you, if you're a student or a teacher or just want an iPad to work and play with part-time, something that does all the iPad stuff but just doesn't cost as much, get the 9.7-inch iPad. The screen is a bit smaller, standard rather than wide color, with no TrueTone, so it can look slightly blueish or yellowish white depending on the lighting, and non-laminated, but it's every bit as high resolution. And even though it's physically smaller it's ever so slightly heavier than Air. It also has an older, A10 Fusion processor, same as the iPhone 7, 2GB of memory, a Lightning connector, Touch ID, two stereo speakers, a 1.2 megapixel, 720p front-facing camera, and an 8 megapixel, standard color, f/2.4, also 1080p rear camera. You can get it in silver, space gray, or gold, with 32 or 128GB of storage, and with just Wi-Fi or with Wi-Fi and cellular. It's compatible with the 1st generation Apple Pencil and Logitech Crayon, but not the Apple Smart Keyboard, though you can get third-party Bluetooth keyboards for it. Savings. Sure, you get less, but if you don't need more, you're also going to pay a lot less — starting at just $329. Bottom line: The 2018 iPad is half the 2018 iPad Pro... for half the price. Same chipset as the iPhone 7, same Apple Pencil support as the iPad Air, faster LTE networking (optional), and access to the same 200,000 education apps and 1,000,000 tablet-optimized apps in the iPad App Store. If you love everything about the iPad Air but just want something smaller, something you can tuck away into a jacket pocket or, sure, even the back pocket of your non-skinny non-hipster jeans, that you can easily take everywhere and do… well… most things with, then check out the new iPad mini. It's got almost all the same stats as the new Air — wide gamut, Retina display, Apple's A12 Bionic chipset, 3GB of memory, a Lightning connector, Touch ID two stereo speakers, a 7 megapixel, 1080p front-facing camera and an 8 megapixel, wide color f/2.4, also 1080p rear camera. And yeah, you can also get it in sliver, space gray, or gold, with 64 or 264GB of storage, and with just Wi-Fi or with Wi-Fi and cellular, so you can connect or share that connection from anywhere. And it's also compatible with the 1st generation Apple Pencil, Logitech Crayon, so you can do all your drawing, markup, note taking, and precision editing. It just doesn't have a Smart Connector like the Air, so you can't get a tiny Smart Keyboard to go with it, though it'll still work with any standard Bluetooth keyboard. It packs all of that Air tech and performance in device with a 7.9-inch display that only about 2/3rds as much as the Air. That means it's got almost everything that's great about the new iPad Air, just in new iPad mini shrunken size — starting at $399. If you need a new iPad and you want it for "real work" (TM), if you're a pro photographer, videographer, audio producer or engineer, designer or musician, if time is money and power is worth a premium, then you want the iPad Pro. The new iPad Pro with its all-new design loses the bezels, so there's less padding to hold onto, but more palm rejection so it's not always an issue. That also means it loses Touch ID and replaces it with Face ID, which less obtrusive but sometimes also less convenient. You also lose Lightning, Apple's — can I call it venerable yet? — iOS connector in favor of the more Mac-like, and increasingly standard USB-C connector. And… there's no gold finish option, because pros are way too serious for that. A ProMotion display that can dynamically ramp down to save power and up to 120Hz for silky smooth scrolling. Apple's A12X Bionic chipset that adds 2 extra performance cores, 3 extra graphics cores, 1 extra gigabyte of memory in the 64GB, 256GB, and 512GB models and 3 extra gigabytes — 6 total — in the 1 terabyte of storage model. And, yeah, that 1TB storage option. Also, in addition to USB-C, which provides support for all sorts of accessories, including displays, and Face ID, which also supports augmented reality like Animoji, you get 4 speakers for stereo sound in every orientation, a front-facing TrueDepth camera with portrait mode, and a 12 megapixels f/1.8, 4K 60 frames-per-second rear camera with quad-LED flash. Phew. You can get Wi-Fi or cellular, and the new iPad Pro also supports Apple's new, second-generation Pencil, which connects magnetically to the side of the iPad Pro and charges inductively, has a new soft-touch finish, and you can tap it to change tools or do other, simple toggles. It also has a new, simpler Smart Keyboard which also protects the back of the pad. And, it comes in both 11-inches, which is similar in overall size to the 10.5-inch Air, and 12.9-inches, which is the biggest iPad canvas you can currently get, but, thanks to the new design, doesn't feel that way anymore. It's literally maximum iPad starting at $799 for 11-inches and $999 for 12.9-inches. Bottom line: If you just need or want an iPad, get an iPad. Apple has good ones, compatible with the original Pencil, going for just a few hundred bucks now. If you need more, something that combines raw power and absolute portability better than anything else on the market, then get an iPad Pro. OK, I know that got a little complicated, especially towards the end there. So I'm going to rewind and bring it right back to the beginning. If you demand not only power and performance but the biggest screen you can get, you can go all the way up to the newly redesigned 12.9-inch iPad Pro, starting at $999.